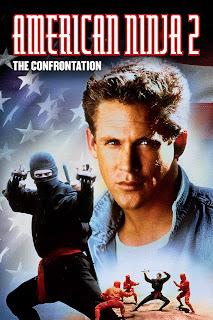 It’s easy to see why people have such fond memories of the American Ninja series after watching this enjoyable movie. Sgt. Joe Armstrong (The Dude) and Sgt. Curtis Jackson (James) return, this time sent to a Caribbean island to find some missing Marines. What they find defies all their expectations, as the super-evil villain known as “The Lion” (Conway) is breeding a new race of genetically-modified superninjas. Now Armstrong and Jackson must fight their way through them to save the day, and shut down the nefarious operation. Can they do it? Because it takes place in a sun-drenched location, the visuals are bright and appealing. When our two heroes fight the evil ninjas, they don’t need a lot of fancy tools and tricks - just, in the case of Jackson, red shorts, and Armstrong, a Body Glove wetsuit. This REAL sequel (as opposed to the miserable American Ninja 5, 1993 thankfully Cannon didn‘t decide to go all “30% new footage” on us) delivers the goods, as it doesn’t retread the first film, but still provides all the best elements that fans want to see: cool stunts, well-timed moves, barfights, chases, blow-ups, tasteful humor, and Dudikoff’s cool hair. It certainly goes in the right direction, as the alley fight sequence about 48 minutes in proves. It was the 80’s, and the idea to set the movie in “paradise” (supposedly “The Lion” owns a place called “Blackbeard Island”) was a natural one. You have to remember, this was at the height of party-animalism. People were cutting loose. Now add to that some out-and-out ninja fighting, and the chemistry between Dudikoff and James and you have a winner. The icing on the cake is the violence, which is brutal at times, but it’s FUN brutality. The whole movie has a sense of fun to it, which is refreshing, and due in large part to the underrated Steve James. He looks like he’s having a blast. James should be more well-known by the general public. While the movie is highly entertaining, the worst thing you can say about it is that it hits a bit of a slump pre-climax. It’s a fairly common problem, but the sawdust-covered arena where the final battle takes place is an ideal location for the inevitable “Confrontation” we were promised in the movie’s subtitle. The time flies by as you watch American Ninja 2 because it satisfies all your action needs. If you haven’t already, pick it up today! 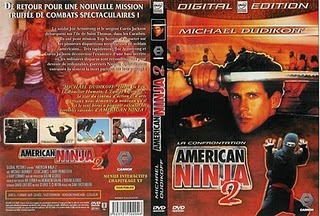 *sigh* If only all the American Ninja sequels could have been this good. I love the bit where they jump off a 100 ft cliff and land on a boat below. Very funny goof to catch in this: when Dudikoff and James first meet "Wild Bill" in the office, freeze it just as they are leaving. Dudikoff is being played by his stunt double (and you see his face). So funny. Will have to check out that funny goof! Words cannot express how much I love this film. Apart6 from Barfly, it's the best Cannon film of 1987. Ed: It is definitely one of the better Cannon sequels. If only Dudikoff was in the 3rd and 5th...it would have been much better. RobotGEEK: Would definitely be interested in your take on all 5 of them one day. 1 & 2 are the best ones. 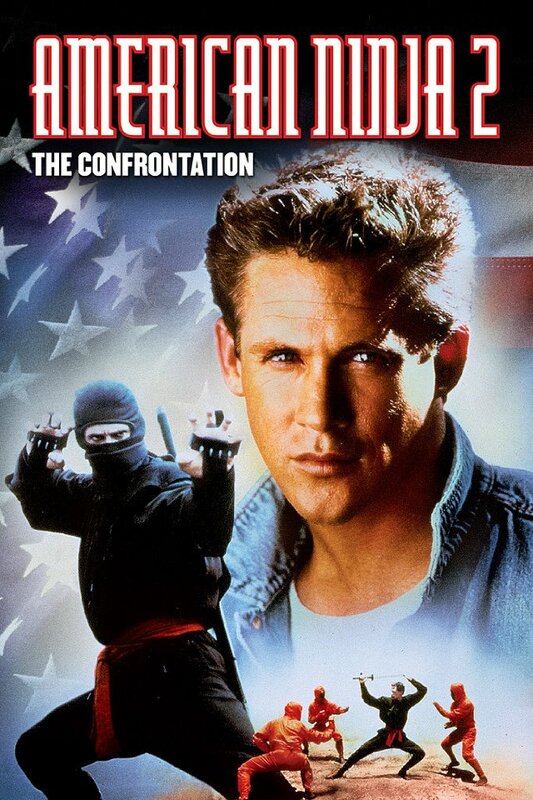 I think I only seen the first American Ninja, that's very surprising that this one was good. Also! That guy on the cover looks familiar, I'm sure I've seen him other movies so awesome! We were surprised too! This could have been the typical bad sequel, but it wasn't. 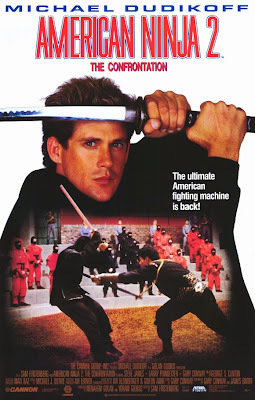 What else have you seen Michael Dudikoff in? He is very cool...plus his hair is awesome! haha. "I want fresh meat!" I love this one, one of my all time classics. I'm glad you enjoyed it, and it looks like everyone else enjoyed it too. Good stuff. Thanks! It is the rare sequel that is just as good as the original!